With almost 160 liters of beer per person consumed each year, Czech Republic drinks the most amount of beer annually. You may be familiar with the term “pilsner,” which is a beer that was first brewed in Czech Republic. The first pilsner was brewed in 1842 in the Bohemian city of Pilsen, and was named Pilsner Urquell, which has now been brewed in the same place for more than 150 years. Not only will the tradition and culture attract you, drinking Czech beer is incredibly cheap — one large beer in center of Prague will cost you only $2! Fun fact: a few years ago, Czech Republic had to pass a law saying that restaurants have to offer at least one non-alcoholic beverage because beer was usually the cheapest drink on the menu. Kofola is a non-alcoholic drink perfect for sunny days in Czech Republic. Kofola was founded in 1959 by the communist regime in order to replace Coca Cola because it was very expensive and communists didn’t want to sell US products in former Czechoslovakia. At first glance, Kofola looks like a Coca Cola, but tastes very different — it has an herbal taste because it’s flavoured with 14 different herbs. After the end of the communist regime, the company almost went out of business because of the competition of global brands like Coca Cola and Pepsi. But during the last 15 years, they have managed to rebrand into a beloved company, popular amongst young and old. Simply a ‘must have’ during your stay! 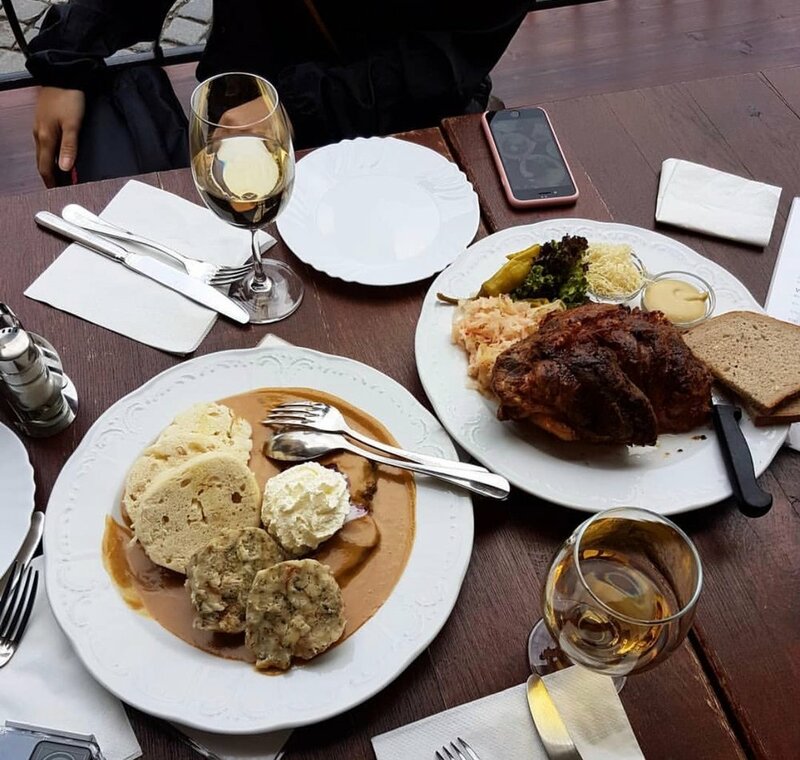 This is one of the most traditional Czech dishes that you must try during your stay! It is roasted beef with sauce made from carrot, celery, cream and many different herbs which make this dish an absolutely unique experience. Don‘t be confused when your dumplings arrive and they look completely different than the dumplings you may be used to. Dumplings in Czech Republic might remind you of some type of bread because they are not filled with anything — they are basically just boiled dough made from flour, eggs, milk, diced bun and yeast. The way dumplings are prepared make them a little dry, but you are supposed to pour the sauce on top. Your plate will probably come with a slice of lemon, a spoonful of whipped cream and cranberries on the top. Traditionally, beef was marinated and stewed with the vegetables for 3-4 days to get perfect flavor, but even today, you can be sure that behind each plate are hours of work to make this national jewel perfect. 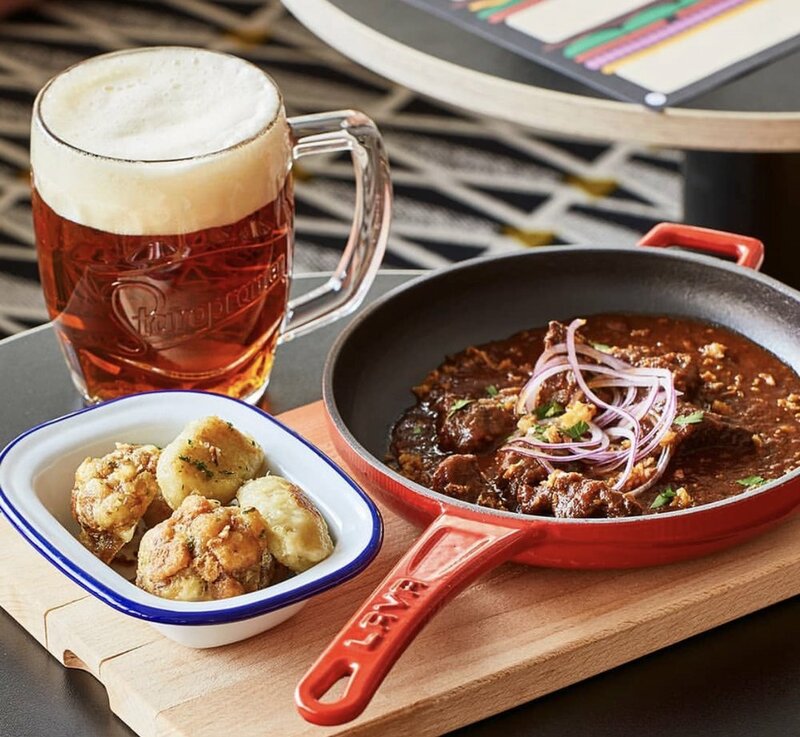 Goulash is traditional not only for Czech Republic, but is considered the national dish of Hungary, as well — each country has their own way of preparation. Hungarian goulash is more like a soup, and the most important ingredient is paprika. Czech goulash on the other hand is served as a main dish, paprika is not that important, and the standard side dish is dumplings. Goulash is typically made from beef, onion, paprika among many other spices, and it can be considered a stew. For a good, strong goulash you need a lot of meat and even more time. The plate is usually topped with a few slices of onion. Perfect for long winter nights, this is a warm soup with a strong flavour of Czech garlic. Quick tip: just don’t eat the soup before you go on a date, you can smell like garlic for a few hours after you’ve finished eating! Garlic soup is always made from vegetable or chicken broth, potatoes, (a lot of) garlic, and marjoram. Optional items like egg, cheese or bacon can be added, and fried diced bread is added to the soup just before serving, so it’s crunchy too! If you order garlic soup in a restaurant, refrain from ordering it in loaf of bread to avoid a tourist faux-pas. Chlebíček is Czech for “small bread,” but it is much more than just that. It could be described as an open sandwich, but that is not particularly accurate either. It is a slice of small white bread called “veka“ with some topping. There are no rules as to what the topping should be, but there are some common combinations: the most famous combination being with potato salad, ham, tomato and slices of cucumber; or with Hermelín cheese, which is a Czech cheese similar to Camembert. This traditional Czech wedding finger-food can be found almost everywhere as an appetizer, and it would be a mistake not to try it! Prague ham is a protected trademark of premium ham, which is produced in a very specific way giving it a unique, mild smokey flavor. The horseradish whipped cream creates another layer of flavour. Czech horseradish is very strong, and without the whipped cream would overpower the rest of the dish. The cream perfectly balances the whole dish, making it mild, sour, spicy and sweet all at once!